The High Court has unanimously held that adjudication decisions cannot be set aside on the basis of an error of law that is not jurisdictional in nature. The decisions in Probuild and Maxcon are significant. If the High Court allowed the appeals, the scope for adjudication decisions to be set aside by the courts would have increased dramatically. Such an expansion would arguably be contrary to the purpose of the security of payment legislation of ensuring prompt payment to builders by establishing a rapid process for recovery of progress payments. 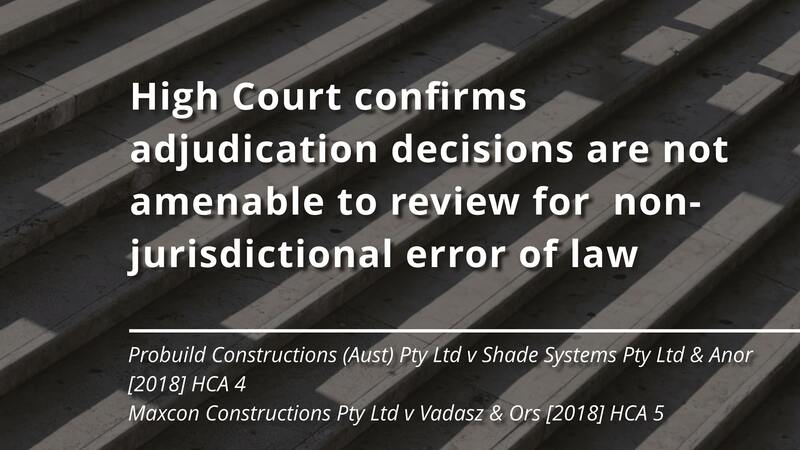 The High Court’s decisions concern appeals from the decisions in Shade Systems Pty Ltd v Probuild Constructions (Aust) Pty Ltd (No 2)  NSWCA 379 and Maxcon Constructions Pty Ltd v Vadasz (No 2)  SASCFC 2. The Court of Appeal and Full Court were required to decide whether the security of payment legislation in New South Wales and South Australia respectively prevented the courts from setting aside an adjudicator’s determination where the adjudicator had committed an error of law that is not jurisdictional in nature. In Probuild, the adjudicator rejected Probuild’s claimed set off for liquidated damages on the basis that Probuild had not established that Shade Systems was responsible for the delay to practical completion. Before the Court of Appeal, both parties agreed that the adjudicator had made an error of law that did not amount to jurisdictional error. the courts can only set aside an adjudicator’s determination where the adjudicator has committed a jurisdictional error. In Maxcon, the adjudicator decided that a clause that provided a subcontractor’s retention could only be released once the head contractor had obtained a certificate of occupancy for the building was void under section 12 of the Building and Construction Industry Security of Payment Act 2009 (SA) (the SA Act). The Full Court of South Australia disagreed, holding that whilst the adjudicator had committed an error of law, there had been no jurisdictional error. The Full Court was of the view that the SA Act does not prevent the courts from setting aside an adjudicator’s determination for error of law. However, due to the similarities between the NSW Act and the SA Act, the Full Court was required to follow the earlier decision of the NSW Court of Appeal in Probuild, unless the Full Court considered that Probuild was ‘plainly wrong’. The Full Court did not consider that Probuild was ‘plainly wrong’, and therefore held that the SA Act did prevent the Supreme Court from setting aside an adjudicator’s determination for error of law. 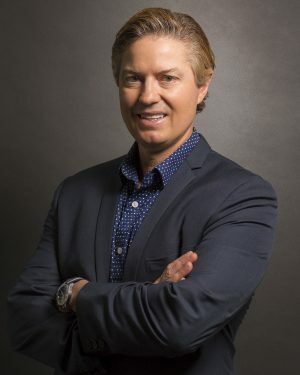 Whether the NSW Act and SA Act prevent the courts from setting aside an adjudicator’s determination where the adjudicator has committed an error of law (but not a jurisdictional error). Whether the adjudicator in Maxcon had committed a jurisdictional error by wrongly determining that a retention provision in the subcontract was void as a ‘pay when paid’ provision. the NSW Act prevents courts from setting aside an adjudicator’s determination for error of law. In rejecting the submissions of the appellant, the High Court placed emphasis on the purpose of the adjudication regime to provide a ‘speedy and effective means of ensuring cash flow to builders’, which has been a common theme in past decisions of the Australian courts which conclude that adjudication decisions are not susceptible to review for non-jurisdictional error of law. The High Court also pointed out that the erroneous decision of an adjudicator was not final in nature, and the parties remained free to correct the outcome of an erroneous decision by way of civil proceedings, in which the parties’ underlying contractual rights remained unaffected. In Maxcon, the High Court upheld the Full Court’s decision that an error of law by an adjudicator regarding the prohibition against ‘pay when paid’ provisions does not amount to jurisdictional error, and therefore does not render the decision susceptible to review by the courts. However, the High Court also held that the adjudicator had not, in any event, made a jurisdictional error. The High Court agreed with the adjudicator’s conclusion that the clause governing retention was void as a ‘pay when paid’ provision because release of retention under the subcontract was dependent upon a certificate of occupancy being obtained under the head contract. The implications of these decisions are significant for the construction industry not only in New South Wales and South Australia but Australia-wide. It is now settled that adjudication decisions are conclusive (at least on an interim basis) and can only be challenged in limited circumstances where the adjudicator makes an error relating to the limits and scope of the adjudicator’s power, or fails to afford the parties natural justice. Furthermore, whether a provision is void as a ‘pay when paid’ provision will need to be considered in the context of the broader contractual relationships between the parties on the project. In particular, a provision which makes the return of retention moneys to a subcontractor dependent on the head contractor’s performance of the head contract will likely be void as a ‘pay when paid’ provision. 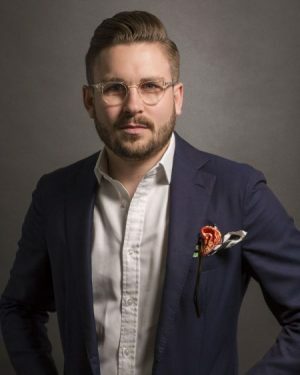 This publication does not deal with every important topic or change in law and is not intended to be relied upon as a substitute for legal or other advice that may be relevant to the reader’s specific circumstances. If you have found this publication of interest and would like to know more or wish to obtain legal advice relevant to your circumstances please contact one of the named individuals listed.